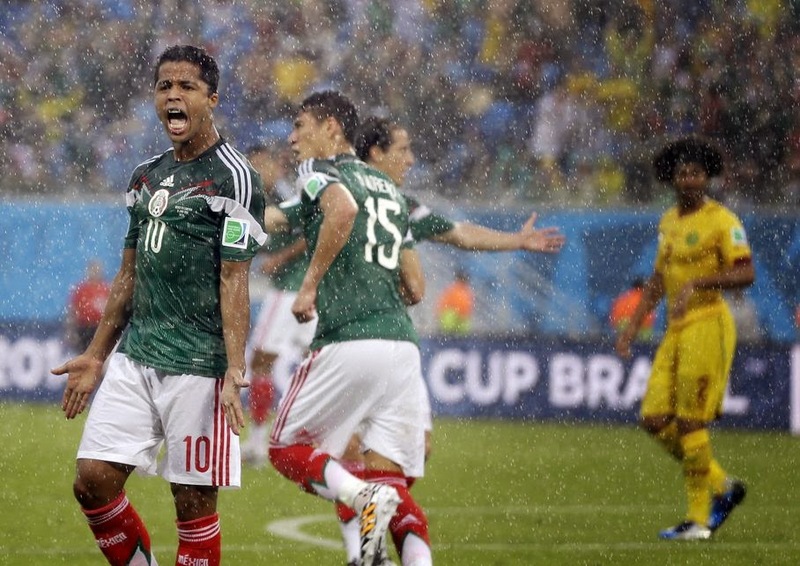 With torrential rain pouring down and two goals already contentiously disallowed, tens of thousands of soggy but boisterous Mexico fans were getting nervous. They had already started chanting for Javier "Chicharito" Hernandez, the striker benched in favor of Oribe Peralta, to come on and deliver a game winner. Seconds after the chant began, Peralta scored in the 61st minute to help Mexico to a 1-0 victory Friday and the three points it needed to have any chance of advancing from a tough Group A at the World Cup. Peralta's goal gave Mexico its first win over an African team at the World Cup and justified coach Miguel Herrera's faith that he could deliver on the biggest stage in the world. A non-factor most of the first half, Peralta broke the deadlock with his left foot after Cameroon goalkeeper Charles Itandje parried Giovanni Dos Santos' attempt from the edge of the area. The goal relieved the pressure that had been building steadily after Dos Santos had two goals disallowed in the first half, frustrating the Mexican team that was controlling the game with its speed and ball possession. "We could have scored more, but unfortunately we're not used to these conditions," Herrera said. "Frankly, the refereeing took away two clear goals, but at the end of the day you've got to work for it, and we get to the next match with three points and very high spirits." Tournament host and favorite Brazil leads the group after a 3-1 win over Croatia in the opening game. Mexico plays Brazil on Tuesday in Fortaleza. While the heat was expected to be an issue in this balmy coastal city, rain soaked the field at the new Arena das Dunas starting about four hours before the match and never let up, creating a cool day but a slick surface. Mexico players said the field held up well and the conditions favored their style of play. "We are ready to play in any type of circumstances," Dos Santos said. "We worked the ball well and it was extraordinary to have the rain." The rain never dampened the spirits of the Mexico fans who arrived hours early, dominated the announced crowd of 39,216 and kept up their cheers and taunts throughout the match. "They made us feel like locals," Herrera said, comparing the atmosphere with Mexico's home stadium. "It felt a little bit like Azteca." Those cheers were sounding nervous as the game remained scoreless deep into the second half. Dos Santos had twice put the ball in the net in the first half only to have both efforts called back. He was ruled offside in the 11th minute and his header from a corner in the 29th was denied when referee Wilmar Roldan apparently called a foul in front of Itandje. His work done, Peralta was taken off in the 74th minute for Hernandez, who nearly doubled Mexico's lead minutes later. But Hernandez misfired a volley and sent it over the net. While a tough shot, the miss punctuated Hernandez' scoring drought. Peralta, on the other hand, is growing in confidence and keen to add to the gold medal he picked up with Mexico at the London Olympics. "I want to score as many goals as possible," Peralta said, "to take advantage of every opportunity that I get because I want to be a world champion again." Cameroon seldom tested Mexico goalkeeper Guillermo Ochoa until forcing him to make a late victory-clinching save with a dive to his left to stop a header by Benjamin Moukandjo. The save was yet another big payoff for Herrera, who started Ochoa after the `keeper had been a reserve at the last two World Cups. At the final whistle, Herrera kneeled, crossed himself and pumped his right fist. Cameroon coach Volker Finke stood with his arms crossed, scowling as the rain dripped off his face. For Cameroon, the lackluster performance will only magnify controversies back home over a player bonus pay dispute that delayed their arrival in Brazil, and will raise more questions about whether they're a fractured team. The loss also leaves Cameroon needing a victory over group rival Croatia before closing first-round play against Brazil. "We have five days to recover," Finke said. "We will analyze this together because the match against Croatia is very important if we want to stay alive".